I joined the PAG in the expectation that we would be able to make a substantial contribution to the design of the MEGA project, in particular the patient cohort selection, about which there had been considerable concern in both the ME/CFS research and patient communities. Recognition and understanding of ME/CFS has been greatly hindered for many years by the muddled and inconsistent use of a host of diagnostic criteria. This problem was acknowledged by the recent US National Institutes of Health ‘Pathways to Prevention’ Report and highlighted in a recent paper from the Cure ME UK Biobank team. It is recognised that broad criteria are needed for GWAS, but nonetheless it is of course extremely important to select the right patients for the MEGA biobank, particularly as they might be used for research worldwide for many years to come. There has been particular concern because the MEGA team Principal Investigator, though regarded as an ME/CFS expert by her close colleagues, did not – to judge from her previous work – appear to have taken on board the importance of such distinctions. Prior to the formation of the PAG, patient concern was to some extent allayed by assurances about the extensive role of the patient advisory group, both on the MEGA website and in person by Prof Holgate when he addressed the Forward ME Group at the House of Lords. ensure you have the information you need to participate in the wider MEGA team effectively. the PAG would need to get together with the MEGA team to resolve the many queries that surrounded the condition of ME/CFS patients. Sadly, my experience was that the vast majority of these numerous assurances were ill-founded. The reality of the PAG differed greatly from what had been promised. In the report I submitted, I went on to give examples of numerous ways in which the reality of the PAG fell short of what had been promised, but unfortunately I’m not able to share them here due to the confidentiality agreement. What I can do instead, I think, is to bring in my experience of patient involvement in research into another neurological condition I have. This has involved answering questions about how far people would be prepared to travel to undergo tests, and whether they would be prepared to go without their medication for part of the day while doing so, that sort of thing. In other words answering important but relatively mundane questions about patient participation in the practice of research. In our discussions amongst ourselves in the PAG, we referred to this as working in a ‘consultative’ capacity, whereby the group would be approached to answer such questions as and when they were needed, an important role yet a very different one from that of collaboration, which was what we had been given the impression would be required from us for MEGA. At the time I left the PAG, some two and a half months in, it was still not clear which of these roles we were supposed to fulfil. We had certainly been told we would be collaborating, more specifically we were to be provided with “a full voice in advising and collaborating with the MEGA team to inform all stages of the MEGA study”. The trouble was that to judge from our experience so far we were really only wanted in a consultative capacity. “To decide on the best colour for the envelopes,” was how I liked to describe it. Which was a joke – but admittedly not all that funny. Though things were much more complicated than I have been able to describe, it was this uncertainty about the role of the PAG and the failure to get agreement on terms of reference which might have defined it, together with frustration about having such little scope for input into the project, which led to my resignation. Our attempts to get more clarity led to a souring of the atmosphere and it was hard to see how progress could be made. Far from being welcome partners in the development of MEGA, we seemed to be barely tolerated. Three of us felt that the time had come to resign. 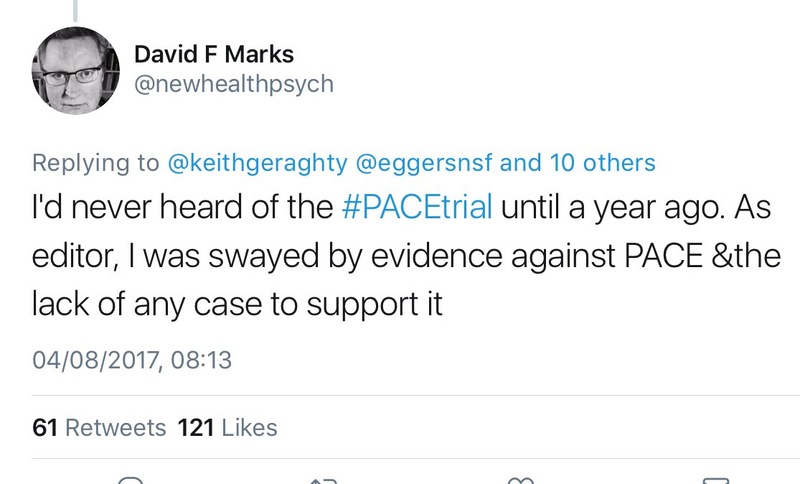 My best guess about what happened is that we were always intended to be consultative but when patients protested so loudly about the plans for MEGA as originally announced, the PAG was seized upon as a way to quieten us down: “Don’t worry – the PAG will be there to make sure it’s all done properly!” Prof Holgate even went so far as to tell Forward ME that “PAG members would be the equal of every other member of the MEGA team” which I have to say struck me at the time as neither likely nor even desirable. Personally speaking, as someone who knows next to nothing about –omics, I wouldn’t expect to have the same authority as an –omics scientist on an –omics research project. But I suppose when your mindset is simply to say whatever it takes to get the troublesome patients off your back, you don’t stop to think too much about accuracy. You’d have thought, though, that they would have had a plan to deal with the situation when the PAG turned up and – surprise, surprise – expected to have, if not the impressive powers they had been promised, at least some say in the matter. Wasn’t it reasonable for us to believe what we (and Forward ME) had been told? Except perhaps, now I think about it, there was a plan to deal with the situation: to ignore the PAG until the more troublesome members resigned in frustration then turn on the charm with the rest. After the mistaken impression previously given about the role of the PAG, however, I hope I will be forgiven if I don’t entirely trust the MEGA website. The recent update reported that three of us had left the PAG and that our “ reasons for leaving have been taken on board”. This was particularly surprising as, at the time that update appeared, two of us hadn’t yet submitted our reasons for leaving. The update also stressed the intention that MEGA will apply for additional funding to include samples from the severely affected and that PEM will be a prerequisite for inclusion in the study. All of this, the update announced, had been agreed with the PAG. Well, OK, but both these strategies had already evolved before the PAG was even formed. They could hardly be described as a breakthrough now. If they had found a way to include the severely affected in the initial bid, then that would be news. On the other hand, the update does at least acknowledge that those affected long term (who may not necessarily be severe) must also be included and it appears there has been some discussion of categorisation of samples. It is not much to go on but perhaps things are taking a turn for the better. It is not before time. I certainly felt that the PAG had a great deal of expertise that was being wasted till now. There are some good people still in the group and I hope they are finally getting a chance to be heard. I’m sorry if my departure has increased the load upon them. I wish them all the best in their efforts to make their mark on the study. It is always hard to be sure of the root of things and perhaps the previous shortcomings of the MEGA/PAG relationship were due to oversight and circumstance rather than intent. Perhaps it is not too late for things to change. I’ve been torn in writing this post because I want to support my friends that remain in the PAG in their efforts to make MEGA better. I’m sure they will give it all they have but the honest truth is I don’t share their optimism. If I did, I suppose, I wouldn’t have resigned from the PAG. If things have changed for the PAG, I suspect it has more to do with spin than substance. I have to judge the study from my own experience, not from a single upbeat blog post. I have to look at the Principal Investigator, her previous work, the gulf between the promises and my experience of the PAG, the feeling of being played along just enough to keep us in tow. I think patients and informed professionals are right to express continued concern about the study. I have feared all along that it is likely to hinder rather than help our understanding of ME because of the way the patients are chosen and I’m afraid I have seen nothing to change my mind. Regular readers will know that I recently received a response from Professor Holgate to our 200-plus-signature email expressing concerns about the proposed MEGA study. “We are very appreciative of the enthusiasm being shown to pursue an exciting ‘omics-based research project in the field of M.E…” he said, with no mention of the various pressing concerns we raised in our email. You can read the whole of his message in this previous post. It is a strange response indeed. It is like the shipping line which ran the Titanic writing to bereaved relatives to thank them for their interest in the general principle of oceanic travel. To carry the metaphor further, Professor Holgate is pleased to be in touch with us, but changes the subject whenever we mention icebergs. I have now received a further response (addressing my response to his response), this one saying so little that I won’t bother printing it here, but once again referring us to the brand new MEGA website, which is indeed up and running at last. Thank you for your response to our email. I have not been able to consult with all the 218 people who signed the original communication but those whom I have been in touch with have expressed considerable disappointment that you did not attempt to address the specific issues we raised in our letter.